TPF4Y's 3rd annual signature fundraising event, May the 4th Be With You, was our biggest one yet, with over 350 people in attendance! Thanks to all you Star Wars fans, our total profit was nearly $10,000, which will help us inspire Indiana students hoping to become the next Galen Erso with exciting STEM programs. Build-Your-Own Lightsaber - take home your very own laser sword! Stormtrooper Shootout - use a nerf blaster to defeat the Dark Side! Droid Driving Competition - maneuver a VEX IQ robot through an obstacle course faster than your opponent! R2D2 Test Drive - drive a mini R2D2 robot around a field using a remote control! 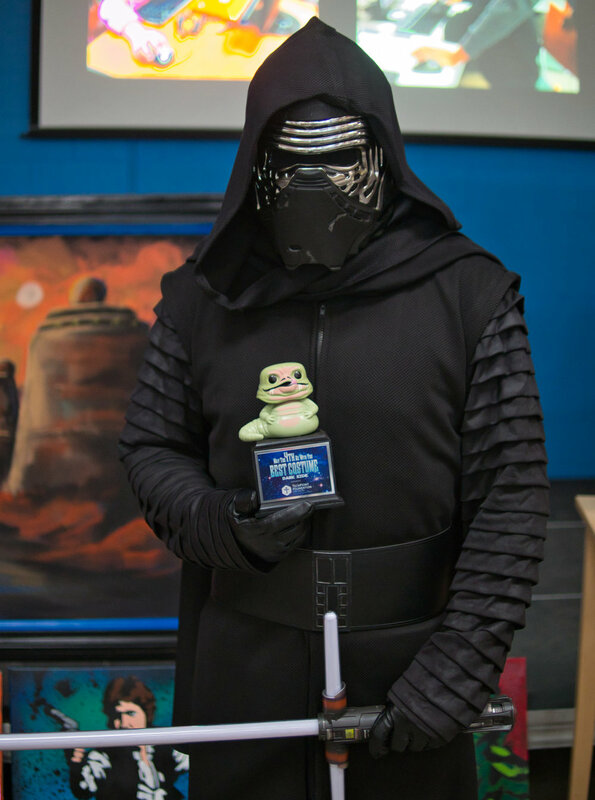 Force Fashion Costume Contest - channel your inner Star Wars persona & win a trophy! The Mos Eisley Cantina, sponsored by our partners at Sun King Brewing Company, was stocked with plenty of beer, wine, soft drinks, and juice, and a ClusterTruck taco/nacho bar kept everyone fed and happy! Check out the slideshow of pictures to relive all the excitement! Welcome to May the 4th Be With You! (Inter)Stellar Raffle featuring lots of fun Star Wars items! ClusterTruck provided a delicious taco/nacho bar for dinner! Preparing to watch Ben Glenn’s chalk art show! Trophies for the costume contest! Newer Post2018 Summer Fun with Technology! Older PostFun STEM Summer Camps!